I am not a “super taster”. My palate is not sensitive nor is subtlety my desired approach in cooking. Forget the understated, muted flavours for me. While I would like to be more “discerning” in my ability to distinguish barely distinguishable flavours, this is not the case. So it is not a surprise that I prefer highly seasoned, strongly flavoured, and spicy foods – not to mention coffee, chocolate, rich caramel, raspberry, lemon, and mint in desserts. One way for those of us who are decidedly not super tasters to enjoy food is through “umami”, which is hard to translate from the Japanese. It describes rich, savoury, meaty, and satisfying earthy flavours, such as prosciutto, Parmigiano Reggiano, ripe tomatoes, as well as soy and fish sauce. Interesting that these are hallmarks of Italian and Japanese cuisines, both of which are noted for their simple preparations of high-quality ingredients. Although everyone can appreciate umami, I do wonder if the non-super-tasters among us appreciate these foods most. For a quick mid-week meal when I was on my own and wanted a particularly fully flavoured dinner, I turned to the umami items in my fridge and created an original dish, which borrows from many simple but classical Italian pasta preparations, e.g., pasta with olive oil and garlic or lemon-pepper-Parmigiano or garlic-chili or capers-and- or….If it is umami you crave – and if umami is your definition of delicious – this recipe is for you. Adapt, as you wish, and enjoy, as you should. 1. Boil water for pasta. 2. Add a tablespoon or so of salt when boiling rapidly. 3. 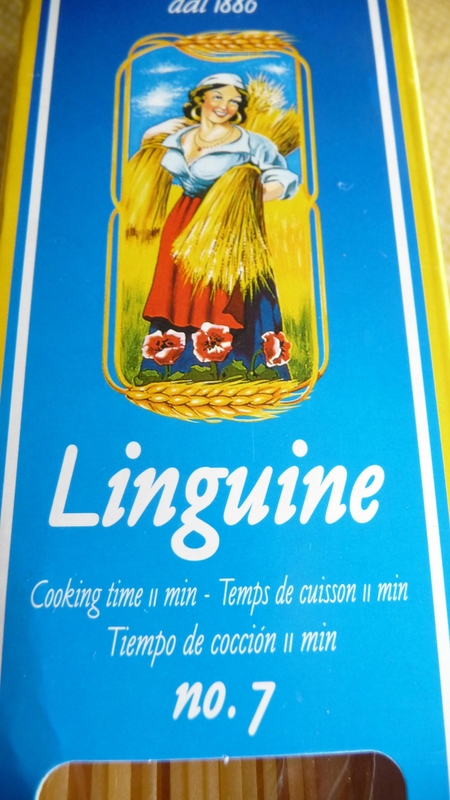 Place linguine in water and follow directions for cooking time – mine called for 11 minutes – until al dente (slightly less cooked is better). 4. While pasta is boiling, sauté the garlic in olive oil in a medium sauté pan over medium heat, watching to prevent burning or excessive browning. 5. When garlic is golden, add capers, squeeze lemon juice, chili flakes to pan. 6. Grind black pepper over the pan, to taste. 7. Take pasta from pot with tongs, so that there is some pasta-water to help loosen the sauce. 8. Add about one-half ounce of Parmigiano to sauce (and additional pasta-water, if needed). 9. Plate the pasta, adding additional of Parmigiano. 10. Add more black pepper and salt, if desired. 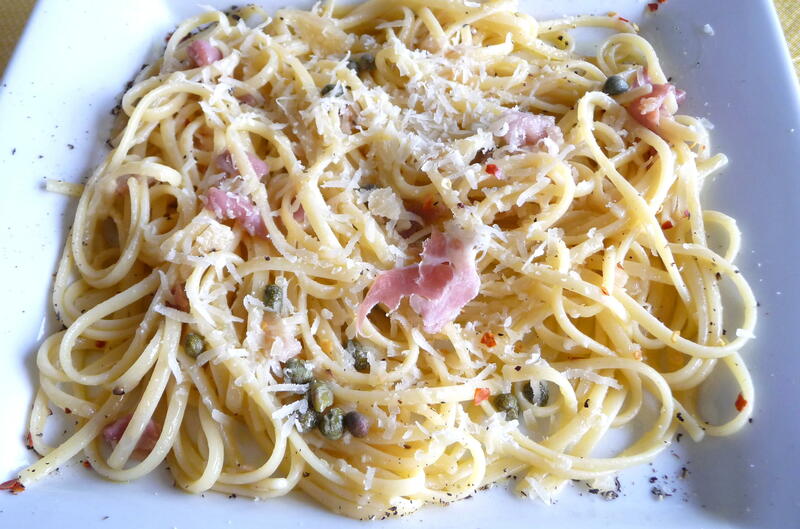 This entry was posted in Main courses, Pasta, Recipes Misc and tagged Dinner, Italian, nutritious, Parmesan, pasta, Prosciutto, Umami. Bookmark the permalink. Thanks, Theresa. I appreciate your comments and am glad that you passed along the Sunshine in the midst of this rain! 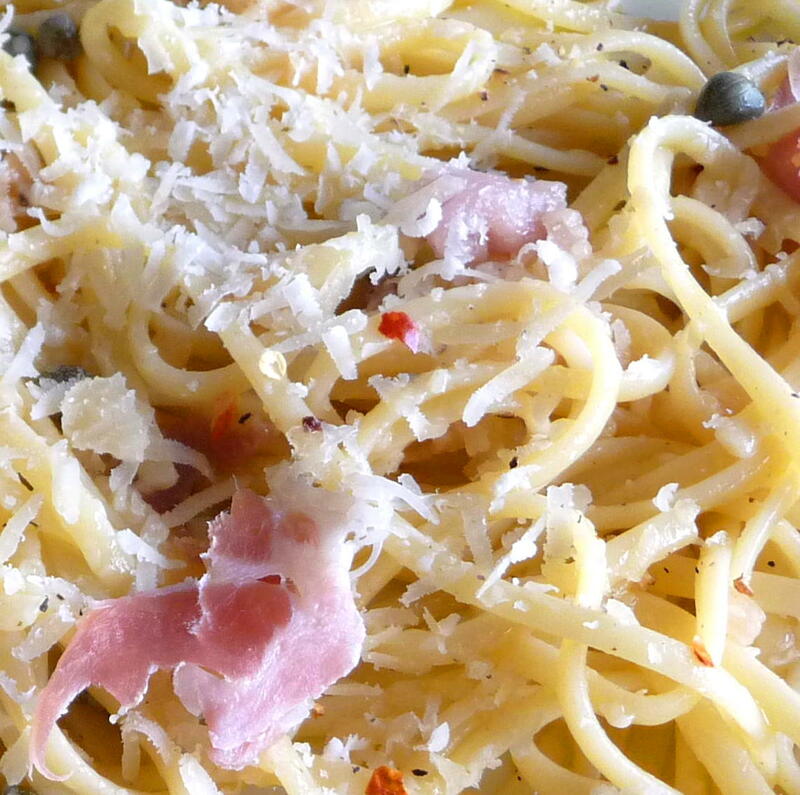 I’m stealing this recipe…As soon as I pop out to the store to get more prosciutto! Hi, Rachel. Do let me know how it works for you – I estimated the portions, so I am very curious to see how it turns out. Just don’t steal the prosciutto, too!